It is so nice to be able to step back in time and revisit past journeys through our photos. The digital age has made it so easy to click, click, click and I think I took over 4000 pictures on my first trip to India. While having that many photos is wonderful, it also makes it hard to pick just a few, LOL. In this post I’ll share some of my favourite pieces that made their way home with me on that trip that I told you about in the January 29th post (click here if you missed it!). Just to remind you, the village is in West Bengal, north of Calcutta. 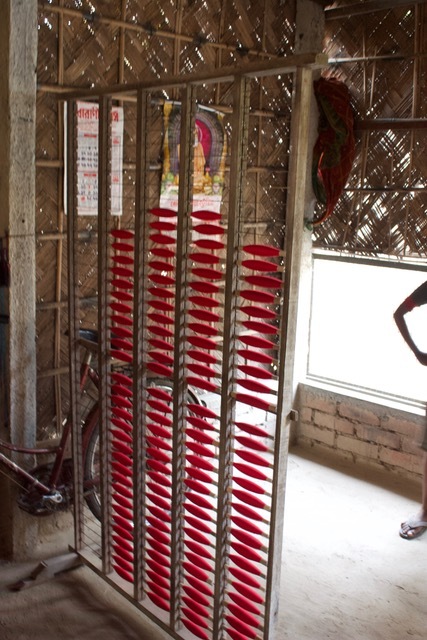 This village is famous for its extraordinary weavers, very fine weaving, Saris and an inlay technique called Jamdani. The majority of the weavers wove on simple 2 shaft looms, with fly shuttle attachments. 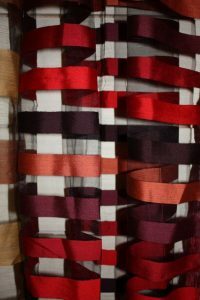 Warping is an extremely meticulous process due to the fine warp threads and the finished fabric is breathtaking. The piece below was woven on 2 shafts with reeled silk. 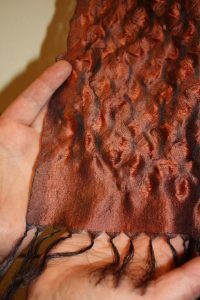 The warp was black and the weft was the colour of copper. If you look right down in the bottom left hand corner of the photo below you can see what the cloth looked like when it came off the loom….simple flat plain weave. All of the texture that you see in the body of the cloth was done by using the thumbs to force the warp threads apart after the cloth was taken from the loom. When I first brought it home it had a wide border all across the bottom about 6” wide but over the years I have been adding texture to the piece by demonstrating how the warps threads were moved. I don’t have much space left to demonstrate…so I’ll have to go back and get another one. 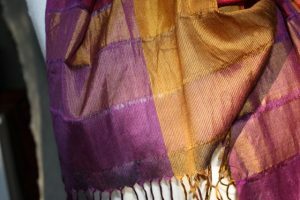 When I hold this cloth in my hands I realize that another artisan used their thumbs on every square inch of the cloth shifting the warp threads exposing the weft threads. 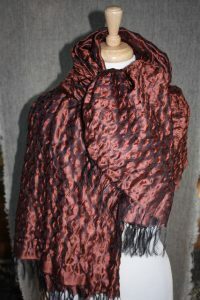 I have draped the scarf on Mary our wonderful model to show you this simple piece of plain weave in all its glory. The next piece is an amazing example of beater control. 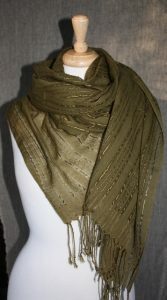 It is woven in plain weave with weft faced bands of 3/1 twill. The warp is like a cobweb, so incredibly fine it almost disappears. A band of gossamer plain weave is woven and then a band of 3/1 twill is woven that covers the warp as it becomes weft faced but because the threads are so fine it has a drape and effect that is absolutely stunning. You can shift those weft bands into the open space but in the 9 years I have had this piece they have never shifted on their own. Another of my favourite simple plain weave pieces has several things going on. 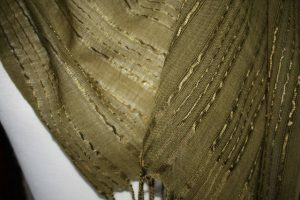 The warp is cotton with a silk weft. 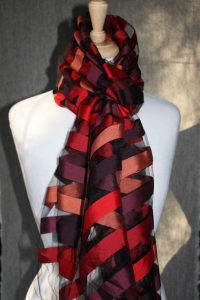 This scarf is so soft…..it is difficult to describe just how it feels in the hand. At first glance it is easy to see the horizontal space that is left every few inches, again controlled by the beater but it also looks like there is denting in the warp. Denting is a technique where you leave an empty dent open in the reed. Those black vertical lines look like empty space but upon closer inspection it is really 3 ends of one colour and then one end of black, there is no denting happening in the piece just the illusion of it. I can’t tell you how many times I have had to use my thread magnifier to figure out what is going on in these pieces. The last piece in this post is woven on 4 shafts and is plain weave threaded into blocks. Some threads are on 1 and 2 and another block is on 3 and 4. It can be woven with a simple tabby tie-up where both blocks weave plain weave from selvedge to selvedge like you see at both ends or it can be woven with one block always weaving plain weave while the other block doesn’t weave at all. The is accomplished in the tie up. The threads on 1 and 2 are always changing places but the threads on 3 and 4 stay in the middle and have one pick that floats over the entire block of them and the next pick floats under them. When you weave this way through the entire length of the cloth you end up with stripes where your warp has no take-up because there is never any interlacement through them, just over and under them. I am so happy to be able to share these particular weavings because this cloth and the weavers of this village challenged beliefs that I had carried around since I started to weave 30 years before. They challenged my ideas around sett, use of reed and beater and about what you could and couldn’t do with thread or structure…it changed my entire thought process around design. I had always loved plain weave but I gained a profoundly deeper respect for it than was there before. I will be eternally grateful to these weavers, for their extraordinary skill and vision and for the gift they shared with me during my 10 days with them. Namaste. Like this post? Please feel free to share their beautiful work on Pinterest using the graphic below! A few weeks back I received a request for information about the beautiful textiles on the back wall of the studio in the videos. Laurel asked if I could share some information about them…. 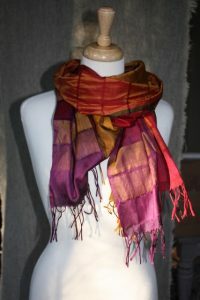 how they were woven, where I found them, interesting facts about them and about my travels. 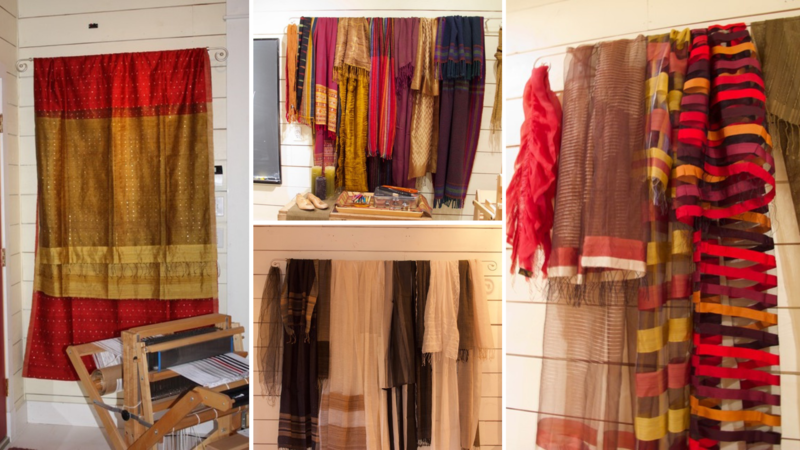 What a great idea… those textiles are hanging on the wall because they provide me with more inspiration than I could use in a lifetime and they are all woven in India. 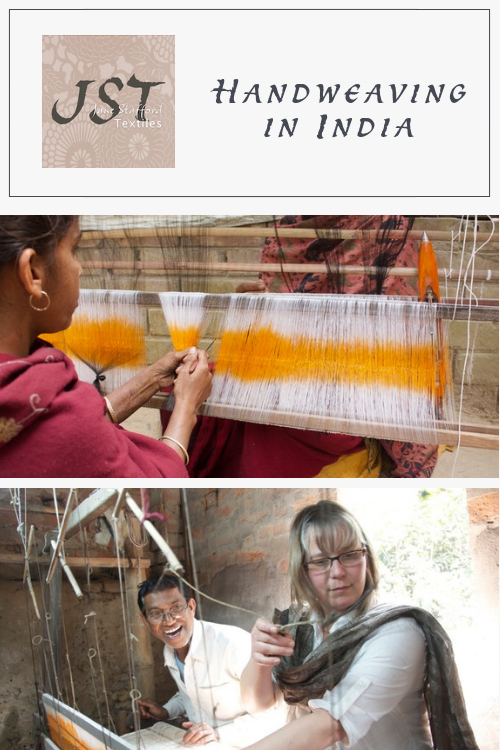 In 2011 I was invited by Charlotte Kwon of Maiwa Handprints in Vancouver to go to India and assist as a weaving facilitator at a Masterclass she was hosting in a village some hours north of Calcutta. That trip changed my life in more ways than I can say. I have been back to India several times since and have also worked in Ethiopia. I’m actually going back to Ethiopia in March to continue working with some of the very fine weavers at Sabahar and I’ll certainly post about that little adventure. 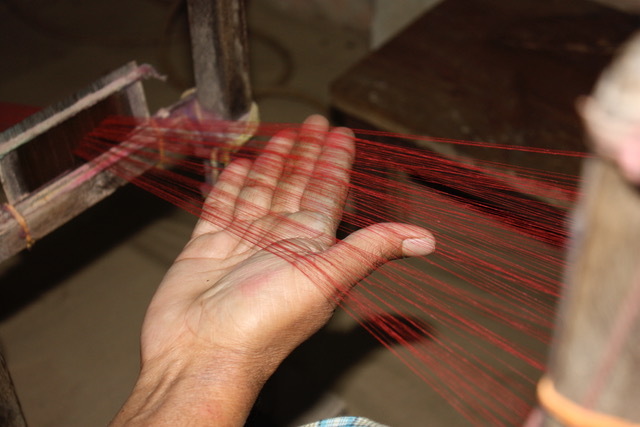 Going to India confirmed what I have always believed…..that we can weave the most beautiful fabrics on the simplest of looms. If our technique is top notch and we train our hands and eyes we can accomplish great things. If we question our beliefs about right and wrong (or it must be done this way) we come to understand that there are a million ways to approach things and everyone needs to embrace what works for them and that is dependent on the resources we have on hand. 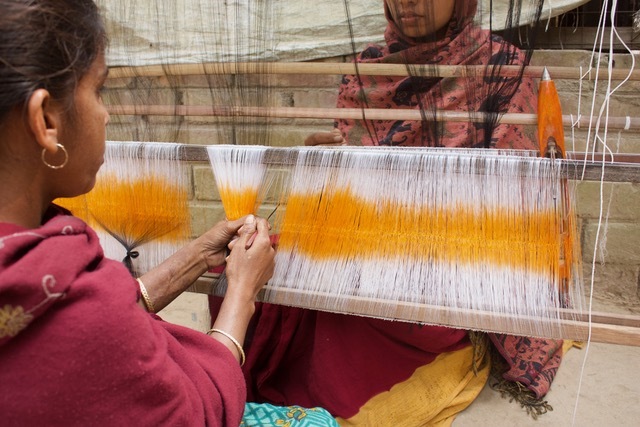 There are 8 million handweavers working in India every single day. Their use of pattern is like a language, it has great cultural meaning and is miles deep. 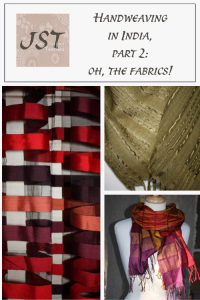 The fabrics created are extremely different between villages, regions and states. This means you could spend a lifetime learning about cloth in India. I could go on and on but I think I’ll start with the warping process in the first village I was in. I’ll add a new post every other post. Remember, in rural India weaving is a village affair, imagine walking into a village where 1000’s of weavers are busy at work. I was in heaven. A simple 2 shaft pit loom. Notice that the beams are all made from giant bamboo. The weavers sit on the ground with their feet in a dugout where the treadles are. 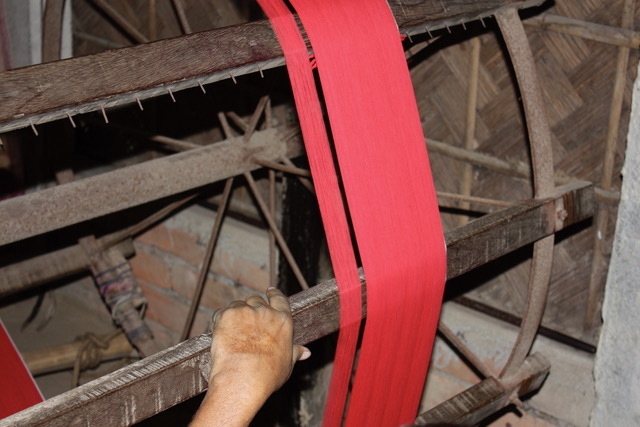 This is a reeled silk warp being prepared. In this village they start by making a gigantic sectionally wound warp and the warping reel will hold warp for many looms. Once it is all on, the weavers bring their thread beams in and wind off enough for their sari or whatever they are weaving. 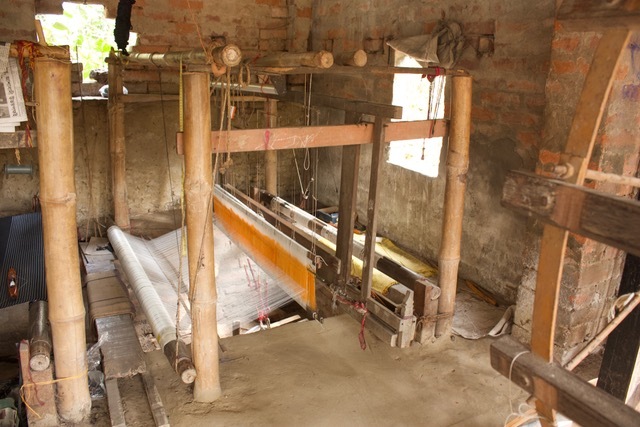 The thread beams and harnesses are taken outside when there is bright sunlight to thread them. Then the beam and harnesses go back onto the loom where they are sleyed and weaving begins. Hope you’ll come back for more.